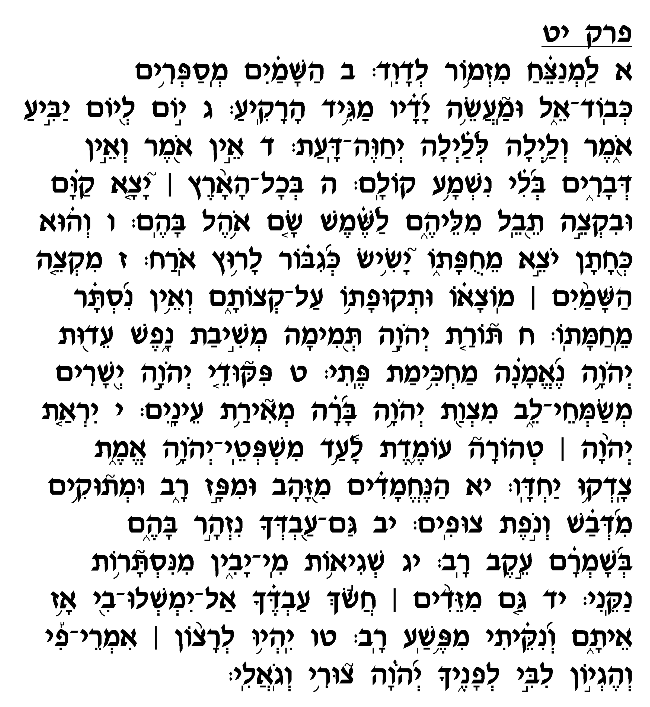 This chapter, which is included in the Shabbat and Yom Tov Pesukei De'zimra service, is very clearly divided into two sections. The first (1-7) speaks of the splendor of the natural world, going so far as to claim that the heavens themselves "tell of the glory of God" (verse 2). Although they obviously cannot speak (verse 4), the sheer vastness and perfection of the celestial bodies testify to the unparalleled handiwork of a Creator and express His greatness to all inhabitants on earth. In the second section (8-15), David turns his attention away from the natural world and onto the spiritual world, namely, the Torah. He beautifully extols the magnificence and purity of the Divine law, and the joy it brings to those who study and practice it. Words of Torah are, in David's view, more valuable than gold, and sweeter than honey and nectar (verse 11). Nothing at all can compare with the inestimable value and beauty of the Torah. In explaining the connection between these two themes – the wonders of the natural world and the greatness of Torah – Ibn Ezra (verse 8) writes that both testify to the infinite wisdom of the Almighty. Just as we are awed by the complexity and perfect harmony of the natural order, so can we be inspired by the depth, profundity and intricacy of Torah. Metzudat David comments that David seeks to emphasize Torah's superiority over even the natural forces. As impressive as the heavens and the celestial beings are, Torah is even greater and more beneficial to the human being. In this Psalm's final verses (12-15), David avows to his strict compliance with these laws whose virtues he has just extolled, albeit with occasional lapses. He petitions the Almighty to pardon these infractions, which in no way reflect any disregard for the Torah's importance, value and beauty.